Yooka-Laylee is an all-new 3D platformer from the creative talent behind the Banjo-Kazooie and Donkey Kong Country games. Weve come together to form Playtonic Games and create a spiritual successor to our most cherished work from the past! 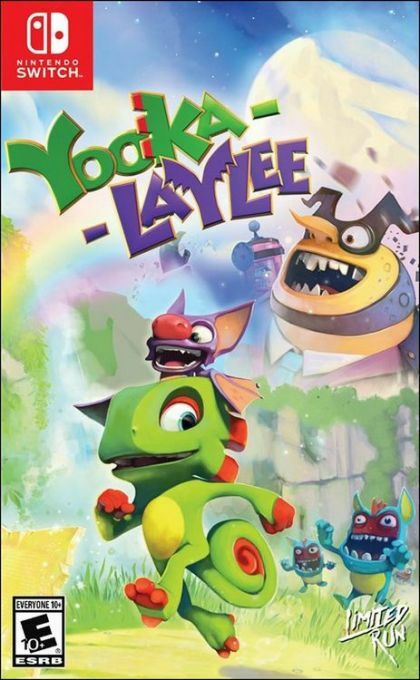 Using an arsenal of special moves like Yookas tongue grapple and Laylees tactical sonar blast, players will explore and expand gorgeous 3D worlds drawn up by esteemed environment artist Steven Hurst (Banjo-Kazooie series, Viva Pinata) and through skill discover the plethora of delicious collectibles hidden within. * Heroes Built for Fun: Our new buddy-duo were dreamed up specifically for entertaining platforming gameplay and exceptional colour coordination. We think we've captured the spirit of our past heroes while introducing our most inventive moves yet. * An Arsenal of Abilities: Sonar blasting, tongue whipping, sky soaring a move roster built for platforming fun and unlocked with added freedom. Additionally, there may or may not be a move involving a giant fart bubble. * A Dream Soundtrack: David Wise (Donkey Kong Country) and Grant Kirkhope (Banjo-Kazooie) combine in what's sure to be a melodic masterpiece! Seriously, clean out your ears - they're in for a treat. * Collect-em-up 2.0: A roster of shiny collectibles with gameplay progression at their core (as well as other, more valuable materials). Every collectible type in our new game will expand gameplay in a meaningful way. Yes, we employ the man responsible for DK64's myriad of trinkets, but we've had a stern word. Our main collectible, Pagies, are used to unlock and expand new worlds in Yooka-Laylee. * Expandable Worlds: Experience more of the playgrounds you love by spending collectibles to expand your favourites into bigger, more challenging worlds. * A Cast to Last: A huge cast of memorable characters to meet (or beat) brought to life by the art and audio teams behind Banjo-Kazooie and destined to endure in future games as part of Playtonic Universe. Expect all manner of grunts, squeaks and squawks. * Introducing Play Tonics: Discover these unique gameplay modifiers and use them to customise gameplay to suit your style. Will you run faster, hit harder or fly further? Also, are they named after our studio or vice versa? We'll never know. * Arcade machines: Each world hides at least one secret arcade game encasing old-school gaming goodness. Complete its retro-tastic challenge to claim your Pagie!